Getting back to my interesting anaemic case load. I was still mentally trying to get my head around ‘Myff‘ and what I could have done better in her management, then I admitted another seriously anaemic patient. The owner brought in ‘Cass’, her 12-year-old female desexed labrador cross that had crashed overnight. The owner said ‘Cass’ had been going down hill slowly over the past few weeks but had suddenly collapsed last night. The poor old sausage could not even muster the energy to get up and I immediately noticed she had a severely distended abdomen. I admitted her to hospital straight away for full workup and proceeded with a blood test and abdominal x-ray and ultrasound. She was confirmed to be severely anaemic and requiring a blood transfusion. I could also palpate an enlarged liver and possibly splenic tumour. Her abdominal ultrasound made us very suspicious that both her liver and spleen were affected. I explained to the owner that her dog most likely had a ruptured splenic tumour with possible liver involvement and requires a blood transfusion immediately and surgical removal of the spleen. Unfortunately, I had to give her a very guarded prognosis because the liver was suspected to be involved. Her dog was in a very critical state and not a good surgical candidate. The owner opted for us to give her the blood transfusion and see if she pulls through the night and discuss potential surgery the next day. The tough cookie survived the night but to my utter dismay she continued to bleed. She was requiring an emergency surgery the next morning which the owner could not afford. It was a very emotionally charged situation for everyone involved. The owner could not let go of her beloved pooch and was devastated about not having the money to go ahead. My vet team felt tortured about watching the patient suffer in silence and not being able to jump into surgery or put her out of her misery. The owner could not make up her mind and wanted to make her final decision when she saw her dog. She looked at her poor old dog and was so broken to make that difficult decision. She kept telling me she would have done the surgery if she had the money. I tried to soothe the owner and explain that we in fact do not recommend surgery in Cass’s state especially because her liver was most likely involved. It was not worth putting her through that huge surgery when we already knew that her days were counted. I felt so much better when I put my patient to rest and knew she was finally at peace. The same day I admitted ‘Cass’, I examined ‘Jake’, a 12-year-old male desexed Maltese cross, that presented to me for continuous shaking and lethargy. The owner had been concerned about his waxing and waning symptoms over the past few weeks. He had one episode of collapse on his back legs 2 weeks ago but bounced back from it. My examination showed that he was guarding his abdomen but I suspected it was due to referred back pain. I got a second opinion and still we could not pin point his major area of concern. I gave him a shot of pain relief, collected bloods & sent it off to the pathologist and booked him in for abdominal/back x-rays the next morning. 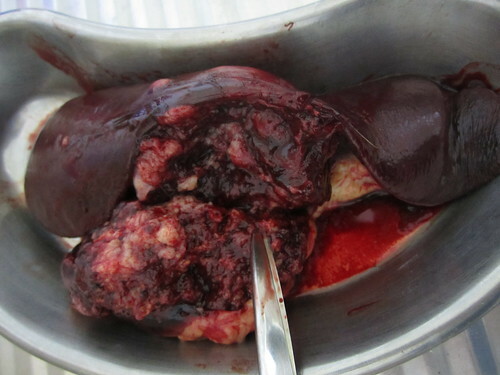 The next day arrived and his abdominal radiographs revealed a large splenic mass and his blood results showed he had a mild anaemia and increased white cell count (indicating secondary infection). I called his parents immediately and informed them of our findings and recommended an exploratory surgery to remove his splenic tumour. I warned his owners about liver involvement and explained we would be unable to resect any affected liver tissue. We came to an agreement that if the liver was confirmed to be involved, we would not wake ‘Jake’ up from the anaesthetic. My colleague Phil did the surgery and found the spleen had ruptured in its central area. Check out some gruesome pictures below of Jake’s ruptured spleen. Phil identifying the spleen and pulling it out for better exposure. Phil clamping all the vessels before removing the spleen to prevent any further bleeding. The whitish surface on the middle bit of the spleen is where the tumour originated. 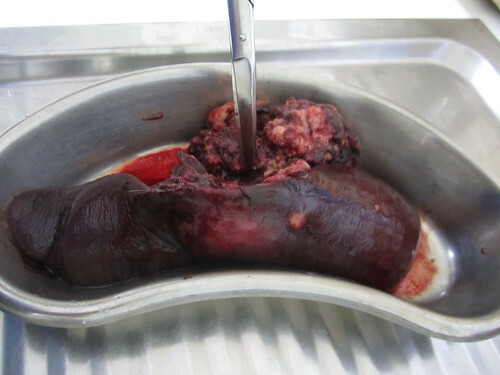 This is the ruptured splenic tissue at the site of the tumour. Fortunately the liver was not involved. I must admit I was relieved that the owners had given me the okay to work ‘Jake’ up. If they had declined the blood test and xrays and simply asked for conservative medical therapy, ‘Jake’ would have most likely presented to us a week later on the brink of death. Instead they followed through with my recommendations and saved their dog’s life! It is important to note that splenic tumours in older dogs are common. They can either be benign (localised and don’t spread) or metastatic (ones that spread). Some dogs can start to appear fatter around the tummy as the spleen gets bigger but that is not always the case. 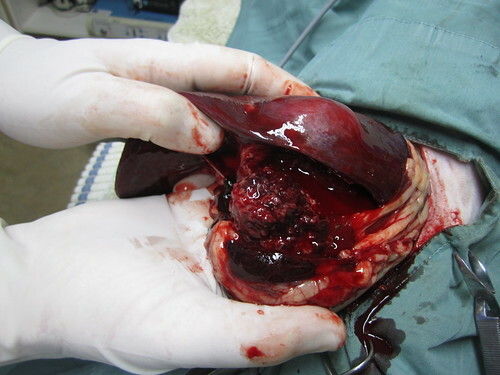 The tumour in a spleen keeps growing until it ruptures leading to a major bleed. 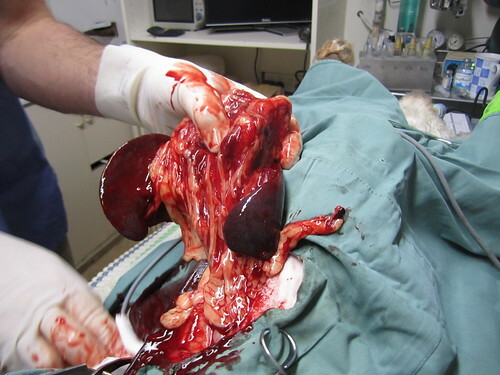 It can also lead to necrotic (dead) splenic tissue and the dog will present with an infection. Both small and large breed dogs can be affected. However, large breed dogs are more commonly affected namely German Shepherds, Labradors and Great Danes. If you get your geriatric dog checked out by your local veterinarian regularly say every 6-12 months, they may be able to detect splenic enlargement in its early stages. At that stage, you can do something about it. Otherwise, splenic tumours can be missed and your dogs can end up like ‘Cass’. I also happened to examine another very complicated anaemic case that same week. Now do you believe I’m jinxed? I’m glad they let you do the workup! I hope that was benign. At my father’s clinic, when I was working there a few years ago, we had some clients bring in their dog with complaints that they thought she had some nasty indigestion. Apparently, Charlotte had eaten an entire bag of dog food and a bag of plums while they were visiting some friends. We put her on the x-ray table and got fairly normal radiographs for a dog her age (12 year old lab mix) except that her spleen looked slightly enlarged. We suggested they take her to the specialist in a town about an hour away to get an ultrasound (there weren’t any good ultrasoundists in our area) just in case since there was no evidence of stomach bloat or anything stuck in the intestines. They took her the same day and found she had a budding spleenic mass. They brought her back, we went into surgery, and removed the offending mass. We sent it to a laboratory for testing and it came back benign. If it weren’t for her case of indigestion from eating so much food, they would never have noticed and it could have become much worse. The same thing happened to a cocker spaniel once, too. The owners were concerned she ate a peach-pit. Turned out she also had a benign splenic mass that had yet to create any problems but would have eventually if we hadn’t caught it when we did. Serendipity is a funny thing, sometimes. Interesting article. I enjoyed the in-depth write up of the case and I’m also glad you posted the photos of the surgery. I think you’re right – many of these problems with pets could be avoided with a twice yearly wellness check-up. I’m willing to be you’re not jinxed but now that it’s more summer like there, pets are outside much more and people are beginning to notice their pet isn’t the same as it was in previous years. All you can do is continue to stress the importance of wellness checks! Sure Doc – I would love to see the pics of Great Danes that you have. I don’t recall where right off hand, but there is a few good Great Dane breeders in Australia. I lost contact with a breeder out of New Zealand that bought one of her Danes in Australia. I remember commenting on how nice the conformation was compared to many of the Danes that are being bred here in the U.S.
Do you have any Great Dane clients ? Hey cowboy…I have a handful of clients that own great danes…one of my vet nurses owns is also a very proud great dane owner…I have posted a video on my youtube of her great dane puppy! Great heads on those Danes in the videos. I have always been extremely picky about not only general conformation of the Dane but how well the head and muzzle is shaped. So many of the judges in the shows have placed Danes with heads that resemble greyhounds or whippets. I like the heavier head with the square muzzle as the standards read. Even though I enjoy nice conformation on a well built Dane, the quality of breeding should always come first. I think every breeder should have at least a fundamental understanding of genetics to avoid many of the problems we have in Danes today. Although, from everyone I have talked with about this, the Danes there and in European countries don’t have a lot of the problems that the Danes have here. Of course, that mostly comes from willy-nilly breeding not knowing genetics and the lack of knowledge with possible medical problems in the line. I’ll stop here and just say again – Your blog is more than just a sharing of thoughts, it’s kind of a Veterinary service online. Gosh, these poor dogs must have been in such pain. I’m glad you are getting some happy outcomes. Thank you Rosie… I can only do my best! Very interesting. I had never heard that older dogs are susceptible to tumors on the spleen. When Thunder bloated, the vet thought she was going to have to remove his spleen, (but she did not have to). I guess the upside of that would have been not having to worry about tumors later in his life. I understand how torn a pet owner can be about not being able to afford surgery. When they took Thunder away for x-rays, he was wagging his tail even though in great pain. We just couldn’t put him down and elected the surgery, (and are still paying the bill 🙂 ). Glad Jake made out OK and you were able to help him. I am happy to pass on the Versatile Blogger Award to you!! So glad things worked out for Jake and you were able to treat him. The pics are great, really puts things in perspective, I didn’t picture the spleen being so large, is that due to the tumor?